So the intention to do the 2016 Wimbleball 70.3 Ironman was set back in August 2015 and I spent the last few months of the year upping my exercise regime to give me a good baseline going into 2016. Looking at the positives, I definitely improved my base fitness quite significantly. I joined the gym in late September to give me access to a regular exercise regime… I know using a gym can be seen as an unnecessary luxury, but it meant that my training wasn’t influenced by the weather and also gave me access to weight-training equipment, and it’s the latter that has had the greatest benefit. I know from experience that concentrating on aerobic running and cycling, probably because it inevitably means long sessions in a fairly static body position (whether that’s upright running or bent over the handlebars), which in turn leads to various strains and muscular issues. So I ’m a strong believer of adding a broad-variety of cross-training options into my exercise to offset those issues, with weight-training offering the greatest benefit to reducing those potential problems. During the first couple months of gym membership I spent a lot of time on the Concept rower. 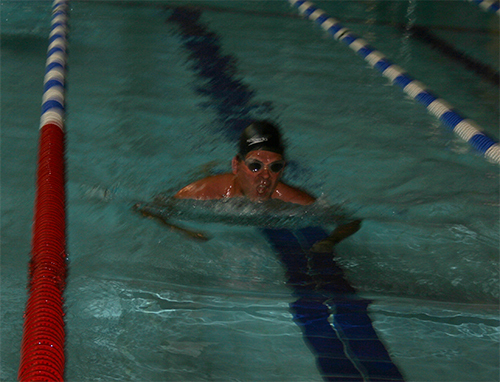 The main aim was to raise my base aerobic capacity with hard 6,000 metre rows, which I further mixed up with longer 10,000 metre rows and some shorter, but brutal, interval sessions. The second aim of using the rower was to build the sort of upper body strength that would help with my swimming. Swimming continued to be my nemesis last year. I’m sure it’s a technique issue, but stringing together length after length wasn’t happening for me. So, while I was trying to get into the pool regularly during October, I backed off during November and concentrated on getting that gym-fitness improved. All went well through the end of 2015, although I had a bit of a set-back over Christmas when a cough and cold kicked in, stopping me from exerting myself too much. As it stands, although the swimming is still a concern, I’m really happy with the fitness improvement I made late last year, and I’m confident that I’m in the right condition to prepare properly for the Ironman on the 26th June. One noticeable change over the past six months has been my body weight and composition. I’m clearly a better shape, with less of that middle-aged ‘tum’, which only goes to show that it takes time to make long-lasting changes. On the weight side, I’m nearly five kilos heavier (up to 92 kg) than this time last year, which surprised me, so clearly the muscle is starting to build… hopefully in the right places.